This client had a very high quality, certified liquid vitamin series that they were only distributing to professional sports teams, and college and university atheletes. They came to us for graphic design of their product line for sales in retail outlets and to the public. The research on this project was quite interesting. For example, it was a surprise to learn that CVS stores on the East Coast, a well known drug store chain, devoted more shelf space to nutritional supplements than any other product in the store! We measured 30 feet of store shelving, 7 rows high! So product competition was fierce. What was also interesting is how badly designed most nutritional supplements actually are. We chose a basic white, simple design with a luxurious photo of the flavorings in the supplement. One of the primary benefits of their product line was the use of all natural fruit flavorings. In addition, they are GMP certified. Important when it was discovered the 80% of the supplements on most store retail shelves did not even contain the ingredients listed on the label! Once we came up with the initial 2 oz packaging design, we moved to the cartons, and displays. 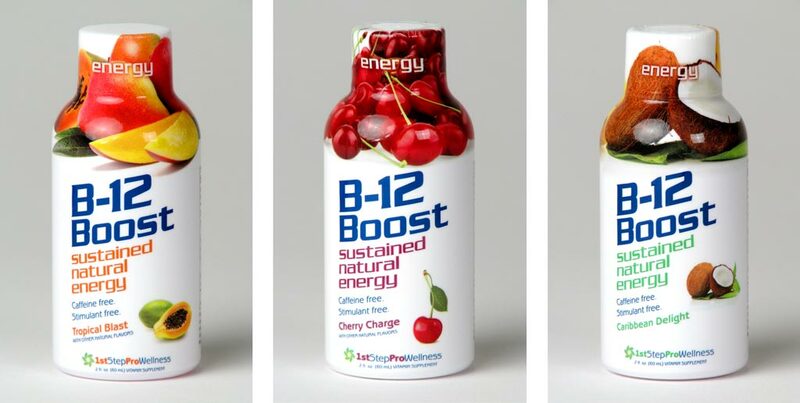 1st Step Pro had been manufacturing certified liquid vitamins for some time, but wanted to break into the retail markets. Good packaging design counts in this arena. We surveyed local grocery and drug stores for what other supplements looked like. I was shocked at the poor quality of most packaging design, and, at the amount of shelf space given to them in stores. Developing a clean simple design was paramount. We picked white as it stood out so well on store shelves. Below is the first round of designs submitted to the client. After qualitative focus group testing they were almost unanimous in picking the design number 5 with the fruit images, but in white as per design number two. They thought it looked clean and of better quality than most supplements. After viewing these they universally disliked the 5 hour energy supplement this product was developed to compete with. We listen to the market!! After the individual bottle designs, we were asked to design and produce a “two-pak” that would not only hang on store racks but be able to stand alone on counter space. The challenge was designing the packaging so that it could be folded into the shape you see here from a single sheet of high quality cardboard. We made extensive use of 3D virtual packaging tools like Adobe Dimension CC, Photoshop, and one of my old standby favorites, Bryce 3D. Making sure the printing layout would be efficient was a challenge as well. The store receives a carton of these display packs. Each one has a simple pull up lid, that when folded into the back shows a display header with a description of the 12 bottles in side. When the carton is empty, a message is seen at the back of the box to ask the store manager to buy more.